South Shore Generator Sales & Service is proud to be an authorized sales, service and warranty dealer for both the Generac and Kohler portable product lines. Portable generators provide instant power virtually anywhere. 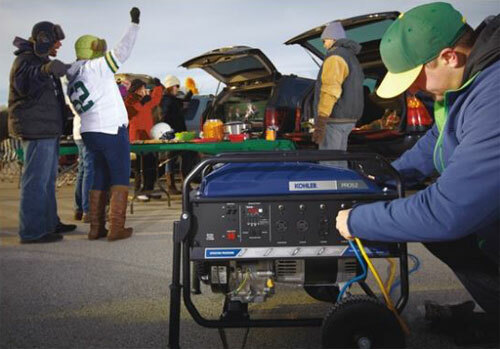 So whether you're camping in the great outdoors, tailgating before the big game, or adding back up power to your home, portable generators give you the power you need where you need it most. And the best part, there's no installation required. Just add some gas and plug in your items for instant power on the go. All you need to do is some good ol' grade school math. First, list out all the items you want to power. Find the item with the most Maximum Power (aka Starting Watts). Then add that number (2,500 W) to the Continuous Power (aka Running Watts) from all the other units (100 + 1,800 + 700). 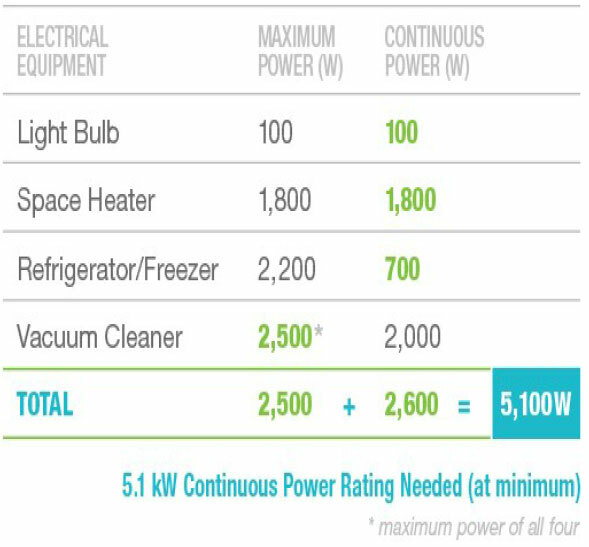 For this example, the total is 5,100 W. So you'll need a generator with a Continuous Power rating of at least a 5.1 kW (5,100 W).